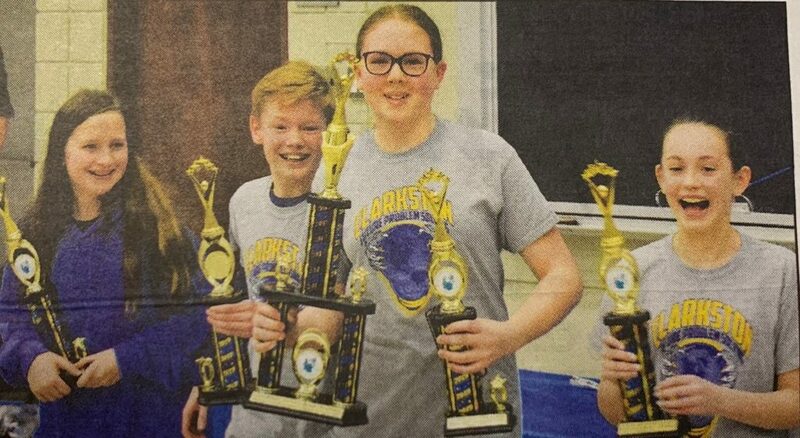 Over the March 23 weekend, the Clarkston Community Schools’ Future Problem Solvers team traveled to Michigan State University for the State Bowl competition and came home with nine awards. This year’s FPS group is comprised of 44 students in grades sixth through 10th. The international program consists of opportunities to work individually and in teams. This year, Clarkston had the majority of FPS students participate in the team Global Problem Solving event, and had students submit creative writing scenarios under the coaching of Nikki Kurmaniak. “My assistant coach, Monica Phillips (also a teacher at SMS), and I stepped into coaching this year after our longtime district coach, Sue Banworth, retired,” explained Butcher. “We were very surprised that all 10 of our Clarkston teams were invited to participate at the State Bowl. And then to bring home nine awards to the district made it even sweeter. We’re so proud of all of them.